Every first Saturday morning of the month — at least when the weather allows — volunteers with Friends of the Fountain and Walk turn out to help keep the historic area around the Fountain at The Circle and Fountain Walk ship-shape. 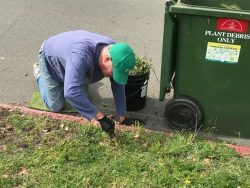 On May 5, we took on a big project: Clearing weeds and other invasives from the replanted median strip that serves as a divider between Los Angeles and Mendocino avenues just off The Circle. It had been re-landscaped late last year, but had gotten pretty overgrown since. The city has not been able to attend to it much, and our focus had been on the new plantings around The Circle. But on this Saturday, we took it on, and after a few hours of probing and pulling and clearing away a couple of green cans full of weeds, the median looks great again. It’s a nice place to rest on a walk between the hills and Solano Avenue, with a pair of benches set beneath a shady tree. 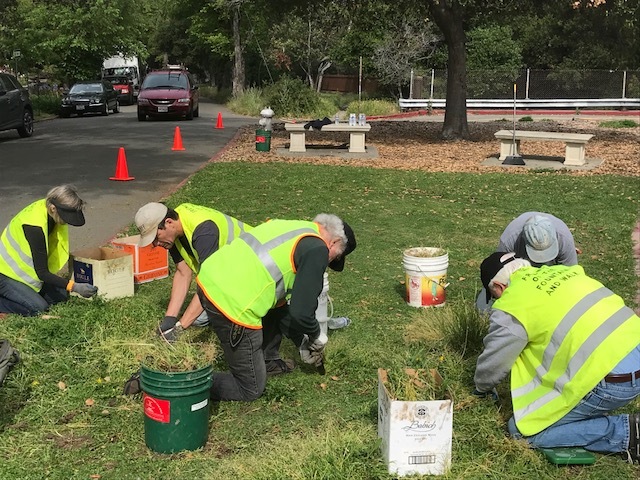 Many thanks to the median weeders — Leo Rainer, Steve Weindel, Karen Borst-Rothe, Jim Reynolds, Richard Engle and John Buchanan. And also to another crew that tackled weeds proliferating on the new plantings on the south side of The Circle: Victor Fong and Dennis and Christine McIntyre. And to Anne Hasse, who wrestled the overgrown geraniums in the large pots surrounding The Circle back into shape. Please consider joining us on an upcoming first Saturday — there is always plenty to do.